Whenever I am looking to make a “better for you” version of a recipe I look for ingredients that I can swap out for lighter alternatives. 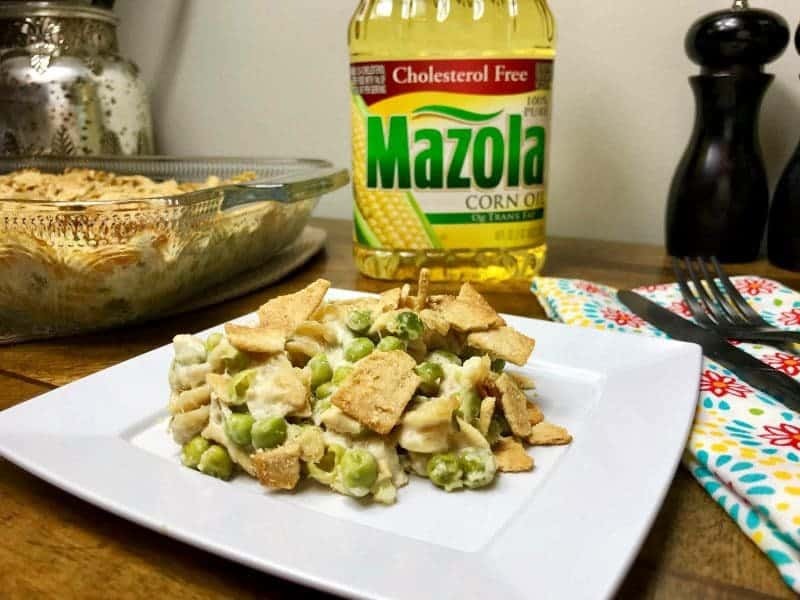 Cholesterol free Mazola® Corn Oil is the perfect ingredient to replace butter and other oils in recipes. A clinical study showed Mazola® Corn Oil reduces cholesterol 2x more than extra virgin olive oil. To learn more about this claim, see Mazola.com. I love that Mazola® Corn Oil has a neutral taste that lets the natural flavors of recipes through. Since it is made with 100% pure oil and contains no additives, it doesn't impact the taste of my ingredients. 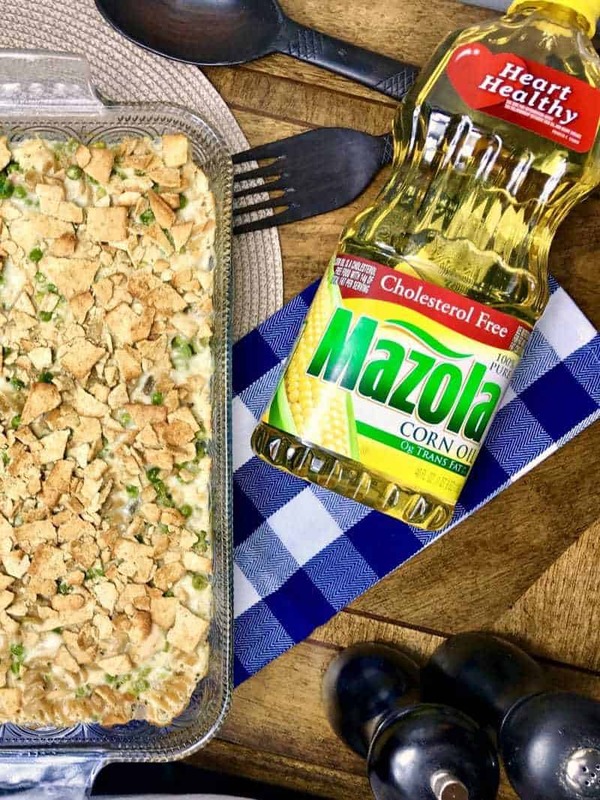 Plus, with a high 450°F smoke point, Mazola® Corn Oil is perfect for everything from baking to stir-frying and sautéing. Today I wanted to share with you my newest recipe makeover: this delicious “better for you” tuna pasta casserole. When it comes to easy dinner recipes for the family, nothing beats a casserole. 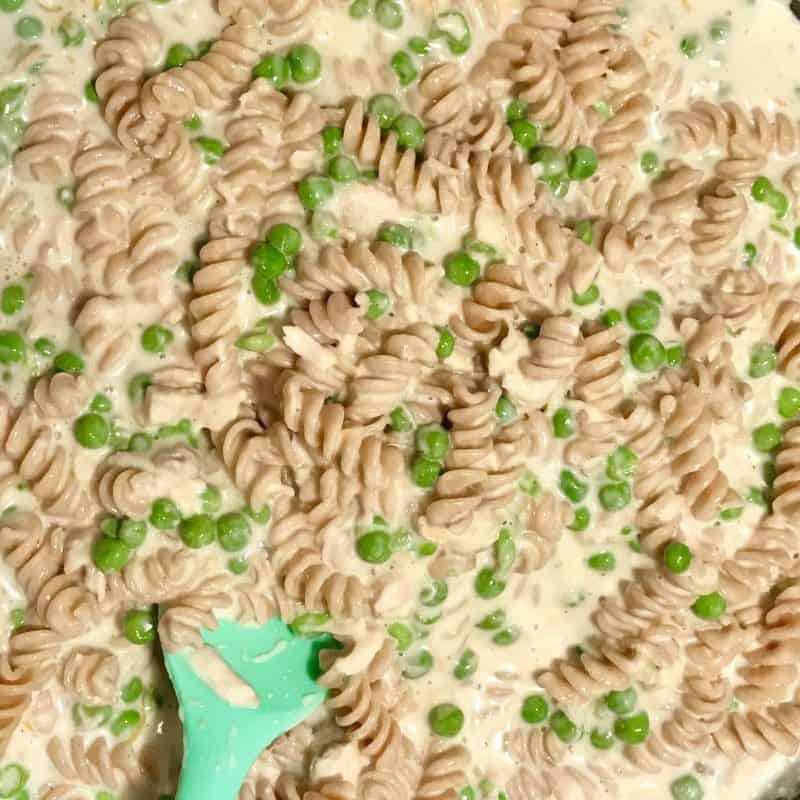 Tuna pasta casserole is a classic, and has been one of our family favorites for years. 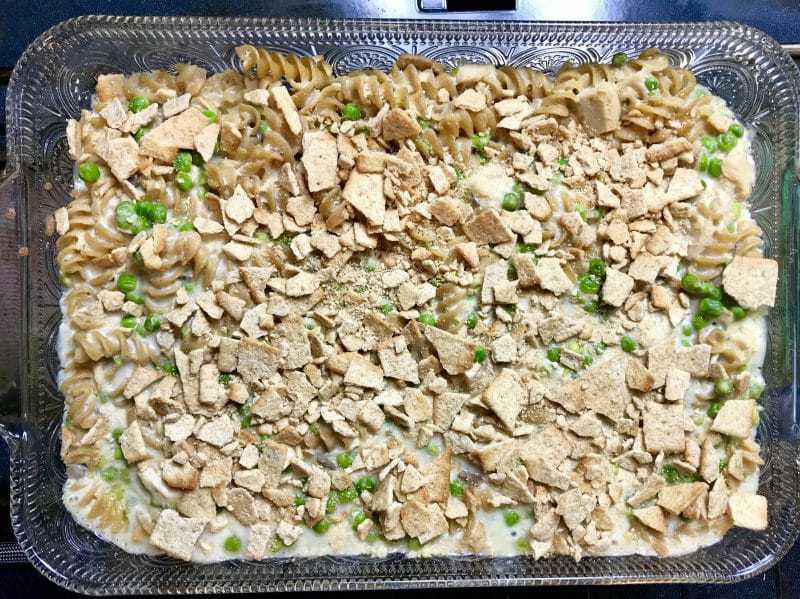 To lighten up our traditional tuna noodle casserole recipe I simply swapped out a few of the ingredients for lighter options. Instead of butter I used Mazola® Corn Oil. 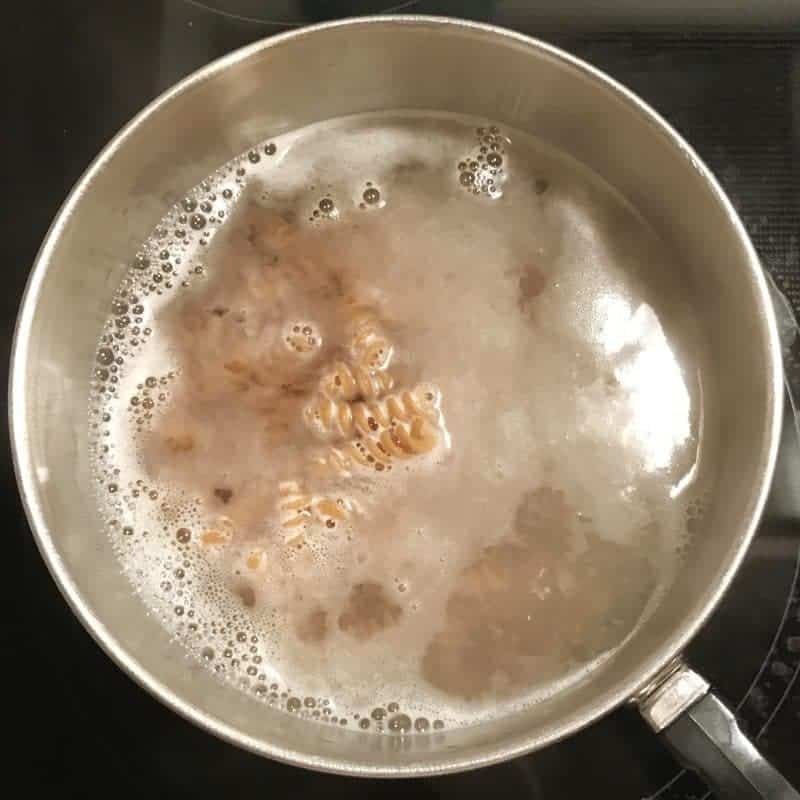 I also substituted whole grain pasta for regular pasta, low fat cream of mushroom soup for regular mushroom soup, reduced fat cheddar cheese for regular cheddar cheese, reduced fat cream cheese for regular cream cheese, skim milk for whole milk, and whole wheat cracker crumbles for bread crumbs. And you know what? My tuna pasta casserole is still creamy and delicious! You can find a printable version of the recipe at the bottom of the post. Prepare pasta by cooking for 2 minutes less than package instructions. Drain and set aside. Grease a 9×13 pan and preheat the oven to 375°F. 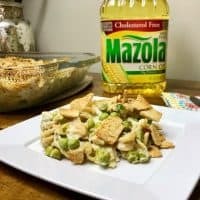 In a large bowl, mix Mazola® Corn Oil, soup, sour cream, milk, cream cheese, pepper, and garlic powder until well mixed. Then, stir in peas, pasta, tuna, and cheddar cheese. Transfer mixture into 9×13 baking dish, spreading evenly. Bake uncovered for 20 minutes. Remove and sprinkle with crushed crackers. Return to oven for 15-20 additional minutes, or until top is lightly golden brown and sauce is bubbling. Let cool 10 minutes before serving. 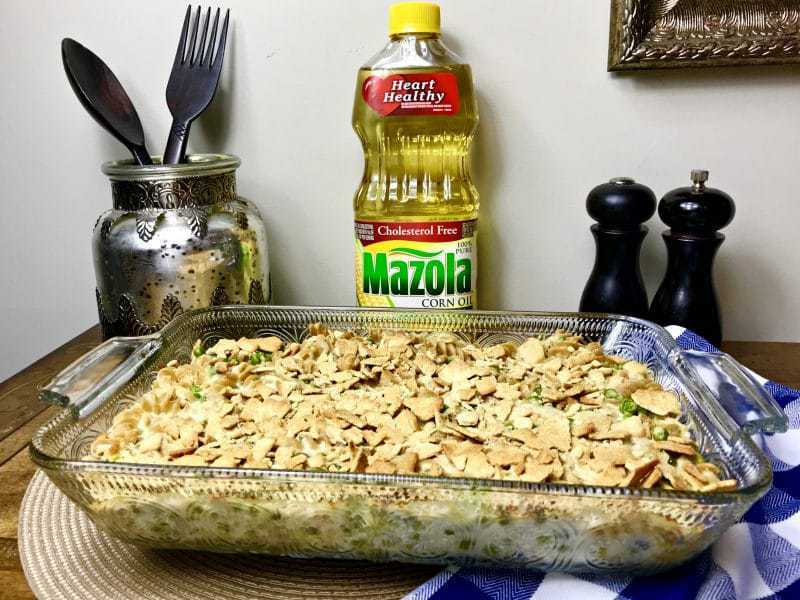 I hope that you enjoy this tasty and “better for your” tuna pasta casserole featuring Mazola® Corn Oil. If you try it, we would love to hear how you like it in the comments below! This better for your version of a classic tuna pasta casserole swaps out some of the traditional ingredients for lighter alternatives. In a large bowl, mix Mazola, soup, sour cream, milk, cream cheese, pepper, and garlic powder until well mixed. Then, stir in peas, pasta, tuna, and cheddar cheese. Transfer mixture into 9x13 baking dish, spreading evenly. Bake uncovered for 20 minutes. Nice homey classic I need to make this dish soon for my family! Thanks for participating in this shop. I love tuna casserole. I can’t wait to try your healthier recipe. Yum! I haven’t had tuna casserole in forever, and I was looking for a recipe to try. This one looks really good – thank you! I love tuna and tuna casserole. But I am going to use broccoli instead of peas. Thanks for the recipe. Oh my gosh this is one of my favorite childhood meals, so easy and good. I love your version and will have to make it soon to try it out. Great idea to lighten up this classic casserole. 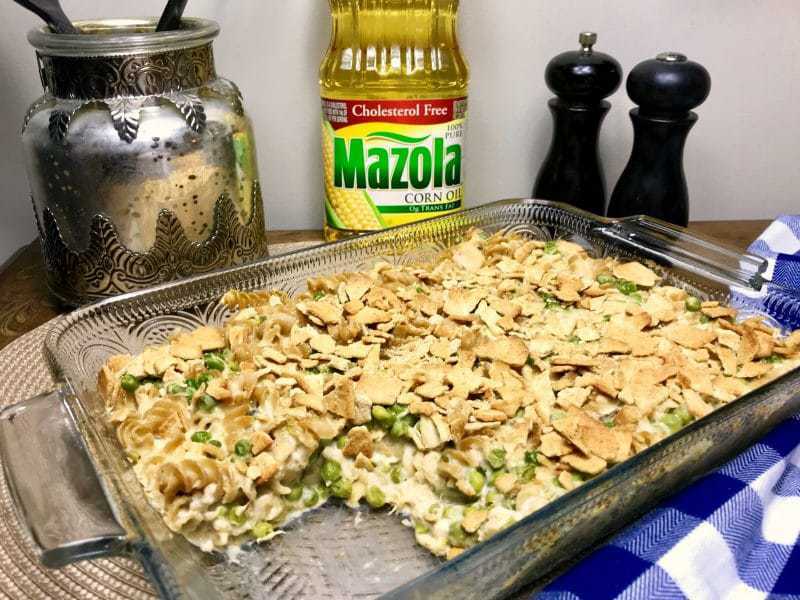 I use Mazola for cooking – love it! I love tuna pasta, it’s such good comfort food! I think tuna and green peas are a perfect match. 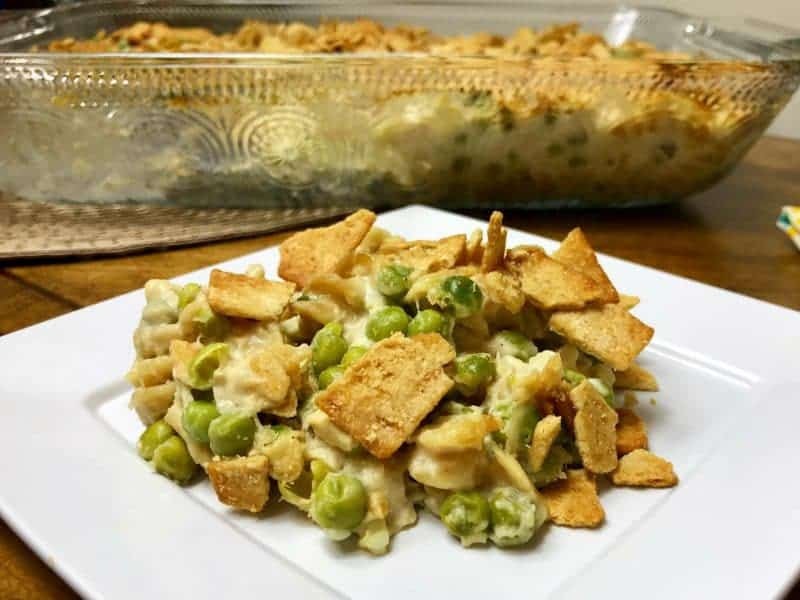 Your lighter and healthier combination – especially the addition of whole grain crackers makes this crunchy casserole dish unique. I love how you took a class Tuna casserole and gave it a healthy makeover. This looks so good, and I bet no one would even notice that it’s better for you than the classic. Thanks for the great recipe!